A new generation of knitters is emerging, one that is young and fresh and excited to take their knitting to new places. In The Knit Generation, eight of these trendy young designers explore color and texture in their ultra-stylish accessory designs. 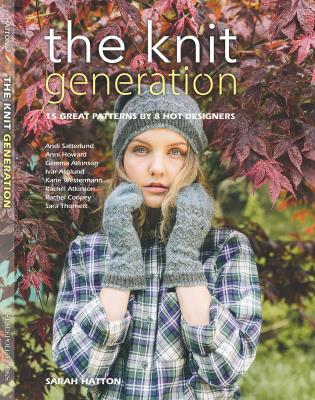 High-fashion photography makes this book a standout among knitting books. The designs are fresh and the look is young and hip, yet the pieces have a timeless quality that makes them wearable by knitters of all ages. Well-known British knitting author Sarah Hatton curated this collection of 15 patterns, which includes hats, mittens, shawls, socks, and more. The contributing designers have their own impressive lists of accomplishments. Rachel Coopey is recognized for her sock designs and is the author of books including A Knitted Sock Society and Coop Knits Socks. Other designers such as Rachel Atkinson and Karie Westermann have had their designs published in magazines such as Knit Now and Rowan Yarn publications. Editor Sarah Hatton is the author of Knitted Scarves & Shrugs (978-19-0754-4392), Sarah Hatton Knits: 10 Simple Projects for Cosy Babies (978-09-5678-5145), Sarah Hatton Knits: Vintage Inspired Projects (978-09-5678-5114), and Sarah Hatton Knits: 10 Simple, Cosy Projects (978-09-5678-5107). She knits and designs her own unique line of patterns in England.